"I haven't thought about [The Lying Game] for so many years, but in a way, I've been playing it all this time (17)." At a small, second-rate boarding school on the English coast, four girls formed a fast and lasting friendship. With very different personalities, Isa, Kate, Fatima, and Thea bonded at Kate's cozy home near the school, where Kate's art master father let them roam half-wild. They also amused themselves by playing The Lying Game, wherein they told elaborate falsehoods to both other teens and adults, gaining points when they did so without being caught. It was supposed to be fun, a diverting way to pass the long hours away from home. When their deeds caught up with them, however, the girls were all expelled in a hush-hush event that left their schoolmates in the dark. Seventeen years later, a dead body is found in The Reach, a tidal estuary through which Isa, Kate, Fatima, and Thea often tromped while scurrying between school and Kate's home. As soon as the discovery is made, Kate, who still lives in her father's home, sends a text to her old friends—"I need you." None of the women want to return to Salten and revisit the past, but they have no choice. They promised to always be there for each other, no matter what. Now is the time for them to stick together, no matter what. As the past and present converge in the little coastal village, four women will be forced to face the truth about what happened during their senior year at Salten House—a truth that could have devastating consequences for each woman's future. Although The Lying Game—Ruth Ware's newest thriller—gets off to a slow start, ultimately the novel is just as engrossing as her previous two bestsellers. The moody, atmospheric setting gives the story a creepy vibe, creating a shivery background for what proves to be a chilling tale. It's more haunting than Ware's others books, and just as compelling. 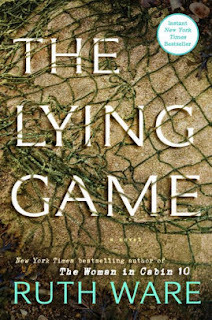 True, the characters are not very likable, and the plot drags a bit in places, but honestly, I still found The Lying Game difficult to put down. In fact, it might be my favorite Ware novel yet. To the FTC, with love: I bought a copy of The Lying Game from Amazon with a portion of the millions I make from my lucrative career as a book blogger. Ha ha. You are such a great source of thrillers and mysteries! This sounds like another good one. Happy to hear you enjoyed his. I have seen some mixed reviews. I do have a hold on this at the library and can't wait for it to come in. Great review! I just snagged this one from the library! I can't wait to dive in! Great review. I haven’t tried any of her books yet but I want them all! This one appeals to me more than the others for some reason. I’m going to have to get my hands on it quick. Ugh! I don't know if I'll like this one. I hate reading books with unlikeable characters. I thought this one was slow in places, too, but still good. Better than Woman in Cabin 10 which I figured out right away. Still, I'm not sure Ware's books live up to all the hype surrounding them. At least they don't for me.